Technics SU-C700 review | What Hi-Fi? The Technics revival took us a little by surprise when it was announced at IFA 2014, but ever since then we’ve been filled with the same nostalgic excitement for its second coming as most other hi-fi enthusiasts. Unfortunately, it’s far from the triumphant return we had hoped for. But let’s start off with what’s good, and there’s no doubting there has been some serious consideration when it comes to the design of the SU-C700. Its size is unusual, sitting somewhere between half-rack and full-rack width at 34cm across, and its rigid casework, made from aluminium, is available only in silver. The big talking point is the large VU meters, which take up the majority of its front panel and are illuminated when the amp is turned on (but can be dimmed). It all looks immaculate, and there’s attention to detail here that’s hard to fault. 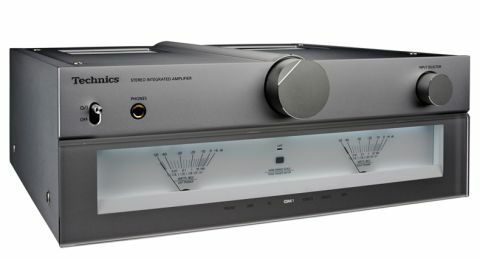 Technics has opted for Class D amplification – perhaps unusual for an amp at this price, but it does suit the unit’s more compact design. The result is a device that runs cool, but one that can be rather more sensitive to speaker matching. There has been an attempt to correct this with a feature called ‘Load Adaptive Phase Calibration’, or LAPC. Once you’ve activated this, the SU-C700 sends out a test signal to determine the electrical characteristics of the speakers it’s attached to, and adjusts accordingly. We certainly recommend taking the time out in your set-up procedure to do this – you will hear a difference by doing it, with everything sounding a little tighter when LAPC is on. The SU-C700 differs from many of its competitors at this price, in that it has a built-in DAC and far more digital inputs than analogue. In fact, there is only one line-in connection, alongside a moving-magnet phono stage, with three coaxial inputs, an optical and a USB type-B making up the digital offering. Unfortunately, when it comes to performance the news is not so good. There’s a real lack of energy in the Technics’ performance, with poor rhythmic drive that often leaves it sounding confused and disorganised. Upbeat tracks lack punch and momentum and softer recordings sound dull and not engaging. Unfortunately, there’s no genre that goes unaffected. Feed it Of Monsters and Men’s Mountain Sound and the bounce and energy of the lively intro is completely lost, instead sounding dynamically flat and uninspiring. Instruments sound one-dimensional, their notes lacking depth and texture, and there’s very little in the way of expression or feeling behind vocals. NAD’s £400 D 3020 sounds altogether more eloquent and organised. A play through of Drake’s Underground Kings shows up the SU-C700’s weakness with timing. The looped melody sounds messy and disjointed from the bass track it is woven around, and the vocal seems unconnected to the instrumental. There’s a fragility too – the confidence of its design has not been replicated in its character, which sounds unsure of itself at times, and a little thin compared to something like the full-bodied Roksan K3. We tried it using both analogue and digital inputs (with outputs to a range of speakers, including Technics’ own SB-C700 and headphones too) and its overall character is replicated across them all. With expectation running high for the Technics revival, this is not the news we wanted to deliver. Unfortunately, we have to, and at this price the SU-C700 is not an amp to consider.